Minotaur are the largest of the races, ranging up to 7-8 feet in height. They are stronger than any other race, and almost as durable as the Dwarves. 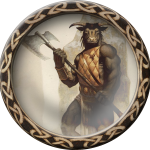 Minotaur are very versatile, but will not steal from other races, so thievery as a profession is out. But by and large, Minotaur prefer to be what they were born to be: a Warrior! From their birth, Minotaur are trained for strength, cunning, and intelligence. They believe that the weak should perish and that might proves right. It is to them, the natural process of life.